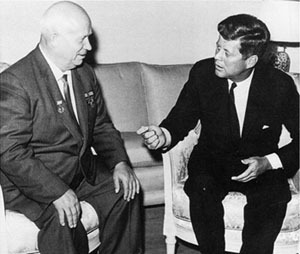 US President John F. Kennedy meeting with Nikita S. Khrushchev, first secretary of the CPSU, in Vienna, June 1961. During the Cold War from 1945 to 1990, there were numerous "stare-down" incidents between the United states and the Soviet Union, including the Cuban Missile Crisis and the erection of the Berlin Wall. Read the textbook chapter 39 and pages 578-87. Check the remarks by Professor Evans on the Cold War (and also my notes for HIS 135 on the Cold War). Submit the Secret Speech paragraph. Read my notes on the Death Mask of Stalin. Read some Recollections of the Cold War in Bulgaria by one of my former students. What do dominos have to do with the study of the Cold War? Was Radio Liberty a bit premature in asserting the prospects for the downfall of communism in Eastern Europe? Read the pamphlet, A Fresh Look at Liberation, from 1957? So, what was it like, studying the international situation in the summer of 1948? Have a look at the notes of Professor Hammond, "The U.S. and Russian Today," (*.pdf file) from that time. The check his similar lecture from 1958, only ten years later, but entitled, "Who Will Win?" (*.pdf file) Yes, the Cold War was really seen in such terms, a "zero-sum" game. We also have a list of some useful websites on the web that deal with world communism. Well, I have all this material from Professor Hammond. One of the more interesting items that I have is the outline to the edited book (*.pdf file) that Hammond put together in 1971 (revised 1975), Anatomy of Communist Takeovers, in which experts wrote case studies of specific communist takeovers from the 1920s to the 1960s. Hammond's outline neatly summarizes the key points to be covered in all of the case studies and then some of the general conclusions to be reached about communist takeovers. It is an excellent book! You can read about the Nike anti-aircraft system that was installed to protect Washington, DC from a Soviet bomber attack in the 1950s and 1960s. Dr. Christopher John Bright focuses on the Nike missile batteries that were set up in Fairfax County in the 1950s/1960s. Log into Blackboard and look for the article entitled "Bright Article on Nike Missile Batteries" under "Course Documents." Propaganda: Your Job in Germany Professor Campion adds: "The clip is from a US military training film produced to prepare American soldiers for their occupation of Germany. The film provides insight into the occupation which helped solidify the Cold War dynamic on the international stage." For a maximum of 50 points extra credit, read George Kennan's "The Sources of Soviet Conduct," and, in a one-page paper, given the benefit of hindsight, assess the accuracy of Kennan's remarks almost fifty years later. Kennan's "Long Telegram," which he posted from Moscow in 1946 is also online, and a bit more hard-edged than the "Sources" article which was published in the journal Foreign Affairs. For 50 points maximum extra credit, read Thomas T. Hammond, ed., The Anatomy of Communist Takeovers (1971) and write a one-page paper explaining the process of the typical "communist takeover." For 50 points maximum extra credit, read Milovan Djilas, Conversations with Stalin (1962) and write a one-page paper in which you explain Djilas' portrayal of Stalin. For 25 points maximum of extra credit, compare and contrast the Nato and Warsaw pact treaties in a paragraph. For a maximum of 25 points extra credit, watch The Russians Are Coming, the Russians Are Coming! and write a long paragraph about the movie's capture of a moment in the 1960s.